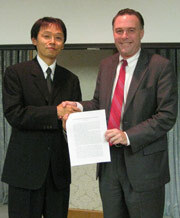 The Government of the United States of America and the Government of Japan convened a plenary meeting in Tokyo, Japan, on November 10, 2008, to review and discuss matters of importance regarding cooperation in the civil use of the Global Positioning System (GPS) and GPS augmentations, including Japan's Multi-functional Transport Satellite (MTSAT) Satellite-based Augmentation System (MSAS) and Quasi-Zenith Satellite System (QZSS). Such consultations are held regularly pursuant to the "Joint Statement on Cooperation in the Use of the Global Positioning System" issued by the then heads of the two Governments on September 22, 1998. During the meeting, the United States (U.S.) representatives provided an update on the implementation of the U.S. Space-Based Positioning, Navigation, and Timing (PNT) Policy. They described the status of GPS modernization and the United States' international GPS cooperation with third parties. Representatives of the Government of Japan reported that a new Basic Space Law came into force in August 2008 to promote measures necessary to develop and utilize space capabilities comprehensively and systematically. Also, Japanese representatives reported that, in accordance with the Basic Act on the Advancement of Utilizing Geospatial Information, the Basic Plan was approved by the Cabinet in April 2008 and the Action Plan was established in August 2008. Both Governments reaffirmed the importance of providing open access to space-based PNT services for peaceful purposes, free of direct user fees. Representatives of both Governments reviewed the ongoing work of the GPS/QZSS Technical Working Group (TWG), which was established to foster close cooperation during the development of QZSS. The TWG reaffirmed that GPS and QZSS are designed to be interoperable and compatible. Both governments intend to continue cooperation in protecting spectrum and promoting standardization of common civil signals. Both governments noted with satisfaction that the Japan Aerospace Exploration Agency (JAXA) and the U.S. National Oceanic and Atmospheric Administration (NOAA) are now collaborating to allow JAXA to install a QZSS Monitoring Station (MS) on NOAA property in Guam in exchange for access to MS data. A similar effort between JAXA and the U.S. National Aeronautics and Space Administration (NASA) is working to establish both a QZSS MS and a Two-Way Satellite Time and Frequency Transfer station at a NASA facility in Hawaii, in support of Japan's National Institute of Information and Communications Technology (NICT) and the U.S. Naval Observatory (USNO). This 6th Plenary meeting strengthened cooperative relations between the United States and Japan. Both Governments acknowledged the important potential contribution of QZSS to the space-based PNT services of Japan. They affirmed that continued close cooperation in the area of satellite navigation will contribute to the peaceful development of the Asia–Pacific region and promote global economic growth.